Today was as pastoral and quietly peaceful as yesterday was industrial and insanely noisy. Thirty two kilometres along lovely flat country roads bordering vineyards and fields of tomatoes, corn and poppies culminated with a couple of kilometres straight uphill into Santarém. 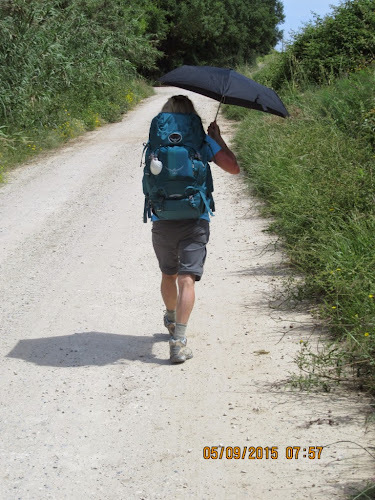 The physicality of walking a Camino is all about endurance, stamina and sheer doggedness with very little cardio except for those last few uphill kilometres. Core work is somewhat lacking. Thinking about this today, Dayton and I were worrying about how five weeks of not 'working out' would mean we would probably be in sad shape when we get back home. 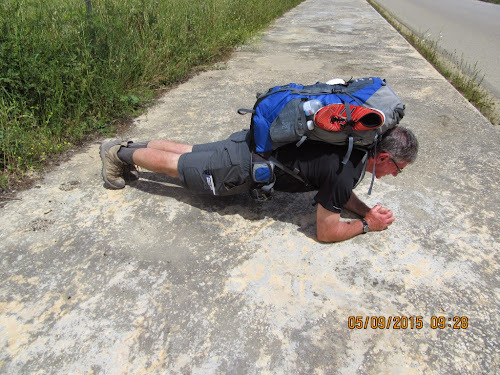 Maybe it was a touch of sun stroke or heat exhaustion but we starting thinking up our own High Intensity Camino Cirucit Training workout. Today's blazing hot sun called for extra sunscreen protection so my umbrella became my parasol. It may look a little silly but it works. And my hubby thinks I'm a touch crazy!! 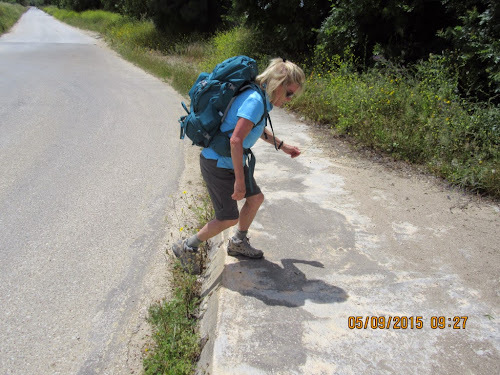 Love the idea though of staying well rounded in fitness while on the Camino! Will have to ponder this as I wait to see how you make out over the next few days~~ Buen Camino! I think you both spent too much time out in the heat. But I love your spirit. You do realize that this was one set of one repetition...photo op only. Even with sunstroke we are not that crazy. Although we did do sufficient reps of vinho branca biceps curls. I like the upper body work out!! And that is still one rep better than I woulda done! !